I used ej45 daddario for a long time and recently switched to Savarez 540R Alliance both are normal tensions but Savarez 540R Alliance seems to be harder for my fingers and the resquado seems to be harsher . What is your opinion about it? So the high E, the B, and the D have significantly higher tension. However, what you feel also depends on string diameter (smaller for Savarez trebles) and bending stiffness of materials which are different here - nylon vs. "carbon". So the smaller diameters of the Savarez trebles should also make you feel like they are higher tension. (I don't know how bending stiffness compares but it is possible its effect goes in the same direction). Key message, though, is that "normal', "high", "low", etc. labels referring to tension cannot be used to infer tension across brands. Hannabach's low maybe close to D'Addario's high (don't know if this was the actual example but there is such a degree of mismatch between labels and tensions across brands). The actual tension as put on the guitar also depends on the length scale (and companies do not quote tension numbers at the same length scale; or are silent at what length scale their numbers were measured/derived). So it is a bit of a mess. The only thing is that gradation of tension labels within one brand corresponds to set (or trebles set or basses set within) tension going in the implied direction. Last edited by guitarrista on Sat Dec 29, 2018 6:49 am, edited 4 times in total. I think he is talking about the Alliance strings which are carbon strings, you gave him tension levels for the rectified strings it seems to me. The Alliance are very high tension strings. As noted there is no consistency between brands. Martin strings are the opposite. High tension is medium. One of the reasons I like d addario. Their mediums feel medium to me. Savarez Alliance consists of 3 carbon treble strings, they are generally stiffer than their new cristal nylon counterparts. If you don't favour stiffer strings, you gotta avoid carbon strings such as Alliance.I don't like them either, except for the compesational 3rd G string. You can try out D'addario EJ 46C that comes with a composite G string. I don't feel it hard tension at all if compares with Hannabach, Augustine Regal or Savarez. I knew that but it seems the numbers I had have changed recently. I updated the image (and text) above with the current Savarez tensions they claim for KF Alliance normal tension trebles. Thank you for pointing this out. Yes, it is not Normal ! It is only appealing to those who favour bright carbon strings sound and who likes to play thin and stiffer strings. Savarez Corum/Cristal 500cr,New Cristal Classic 540cr and New Cristal Cantiga 510cr should be okay for you. Don't buy the "cj", this refers to Hard Tension, it is going to be tighter on 65cm scale guitar.I even found them hard on my 64cm guitar,although this tension sounds great on it. 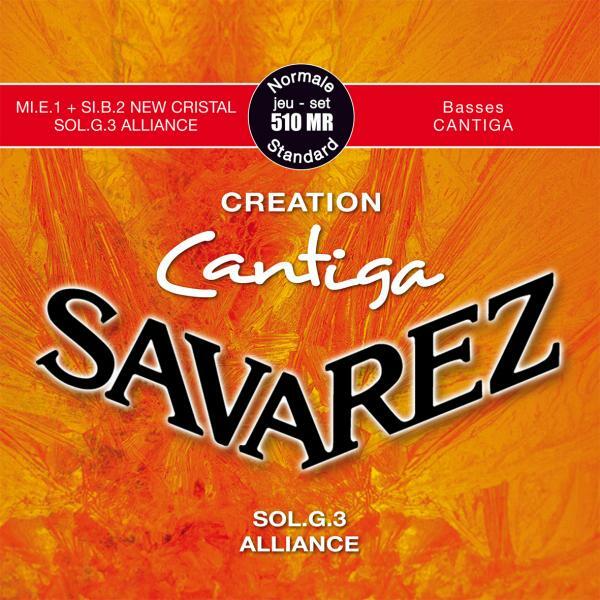 If you would like to stick with Savarez strings at this time yet the normal tension (NOT high) Cantiga Creation set. They will feel better and in my experience sound better too. Be informed the Cantiga Creation set consists of carbon on the 3rd string. E and B cristal nylons, cantiga bass strings. Yes, that’s it. As mentioned above carbon G but nylon b and e, coupled with the best basses I have heard from Savarez. Alliance are carbon. This is another of the newer mixed sets they're doing, Cristal/Cantiga/Alliance G. I'm currently using HBs and I still use an Alliance G with them. I had two sets of those on two different guitars. With me New Cristal trebles (1E and 2B of this set) raise in pitch after a few minutes of arpeggios, while the Carbon 3G does not, neither do the basses. I am returning very frequently with these. I was more happy with the 510CR (all New Cristal). Here all trebles raise. I asked about the raising of the trebles some time ag anc got the answer this is normal for traditional nylon strings. I tried a few other brands of nylon trebles and they all do to some extent. I was told that Carbon strings do not do this and have confirmed that with s full set of Savarez 510 ARJ. I currently have a set of Aranjuez Suave A800, which I find quite tolerable in that respect. The 2B seems to raise the most, while the 3G does not raise as much - to my surprise. The 4D also raises a little. In summary I find the detunining more tolerable and do not retune so much. Are these your first Carbon strings? I recommend you to give them time to develop. They need time under tension to sound their best.